Believed me, one of the most frustrating things about iPhone is how its battery drains so fast everyday. Many users are complaining that even turning off features such as GPS, Wifi, Bluetooth, running few apps, etc, to optimize battery power still not enough. A very small percentage of iPhone 5 devices may suddenly experience shorter battery life or need to be charged more frequently. The affected iPhone 5 devices were sold between September 2012 and January 2013 and fall within a limited serial number range. If your iPhone 5 is experiencing these symptoms and meets the eligibility requirements noted below, Apple will replace your iPhone 5 battery, free of charge. Apple’s Engineer 6 didn’t mention about iPhone 4/4s which also had horrible battery life and reportedly says they have no idea what's causing the problem. 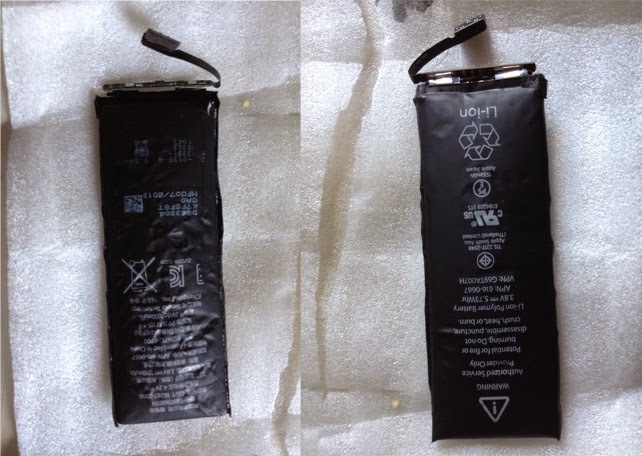 And this is what actually happened to my GF’s iPhone 5 – In just 10 months suddenly the battery got bloated and the iPhone 5 deformed. When charge it’s good to go for an hour only and it’s hotter. I missed to take a photo of the iPhone 5 itself but if you will look on it, you will notice that the screen go up and had blue lines. If you’re iPhone is not eligible for the free replacement your last resort is to buy online or get the help of local technician. The replacement will cost you around P1300 (approx. $35). In eBay or Amazon, you can buy an iPhone battery replacement for as low as 5 dollars with tool, good as the original but you will install it by your own. While Apple claimed that iPhone’s rechargeable battery has overcharging protection features we must be aware that it has a limited lifespan. After over 400 charges, the battery will eventually die. Leaving it charger connected overnight is not a good practice as well as it can cause overheat and it degrades it. Some users claimed that a lightning strike can also destroy the battery if left connected in the wall so; having a power bank might be practical option. Note: the defective battery must be disposed properly. According to experts exposing it to heat / sunlight can cause explosion or damage.